When you’re looking at Cape League rosters, it’s not very often you come across a local kid from New England. It’s even rarer to see that local kid break into the big leagues. But for Milton, Mass., native and former Orleans Firebird Alex Hassan (Duke) he’s proving local talent has what it takes to be successful after his first couple weeks with the Pawtucket Red Sox. Hassan, who currently plays outfield for the PawSox, played in the Cape League for Orleans in 2008 and briefly in 2009, before signing a contract with the Boston Red Sox. He’s made his way up through the organization, and after a stellar year in 2011 with the AA Portland Sea Dogs, he got promoted to AAA and is one step closer to the big leagues. Hassan was equally as excited when he learned four years ago that he would be playing in the Cape League. He said growing up as a kid, he used to attend the games and he knew about the good reputation the league had before he suited up in an Orleans uniform for the first time. For most, the Cape League proves to be a valuable learning tool for college players because it helps them get used to playing baseball everyday. And for Hassan, his first season in 2008 was a humbling experience. 2009 marked a much more productive summer on the Cape for Hassan. Prior to arriving in Orleans, he was selected as a 20th round pick for the Red Sox in the 2009 MLB Player Draft as a pitcher. Not only did he lead Orleans in saves that season, but he also led the team in RBI’s and provided solid defense in the outfield when needed. He boasted 33 hits, 19 runs and a 1.18 ERA in 2009. It was this versatility that led to a contract signing with the Red Sox at the end of July, cutting his Cape League season short. Hassan has always been a Red Sox fan. He loved the team so much, in fact, that his parents helped him construct a mini Fenway Park, complete with a Green Monster and Citgo Sign, in the backyard of his Boston suburb home just 12 miles away from the real park. Growing up, there was no doubting what he wanted to do. But you rarely hear success stories of local guys getting a chance to play in the big leagues, let alone for the teams they grew up idolizing. Lou Merloni, Rocco Baldelli and Rich Hill are just a few names out of hundreds that have played for the Red Sox in the past decade and before that there were players like Tony Conigliaro, Wilbur Wood and Rich Gedman. So what is it about this region that leaves baseball players few and far between? Hassan hopes to join the ranks of the local player success stories, and so far he is off to a decent start. While he’s still looking to hit his stride at the plate and he’s only batting .179, he has still managed to drive in two runs. His great awareness of the strike zone and patience at the plate have earned him nine walks. 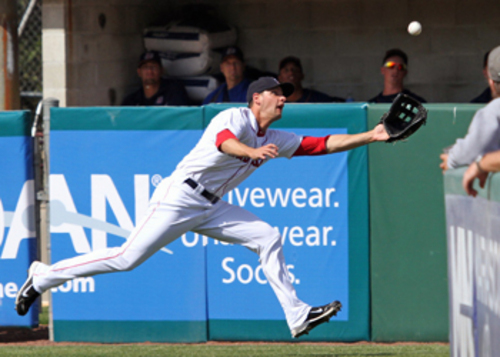 Defensively, his accurate and strong arm in the outfield has helped the PawSox big time with run prevention. While Hassan is making progress achieving the Major League dream and proving himself on the professional baseball circuit, he knows he’s a work in progress.